From Sunday August 14 to Tuesday evening Aug. 16th, I attended several presentations, keynotes and events I intend to share with you. I also met some interesting individuals along the way I will also portray here. First and foremost, I would like to thank sincerely Miryam Yataco for insisting on my attending WIPCE and in general getting familiar with her Peru. Miryam has been instrumental, a real key and eye opener not only into Peru’s reality but on what goes beyond the surface. As we were waiting for the first keynote to take place, here is a photo of a very special lady in Peru, Quechua former Congresswoman Hillaria Suppa. 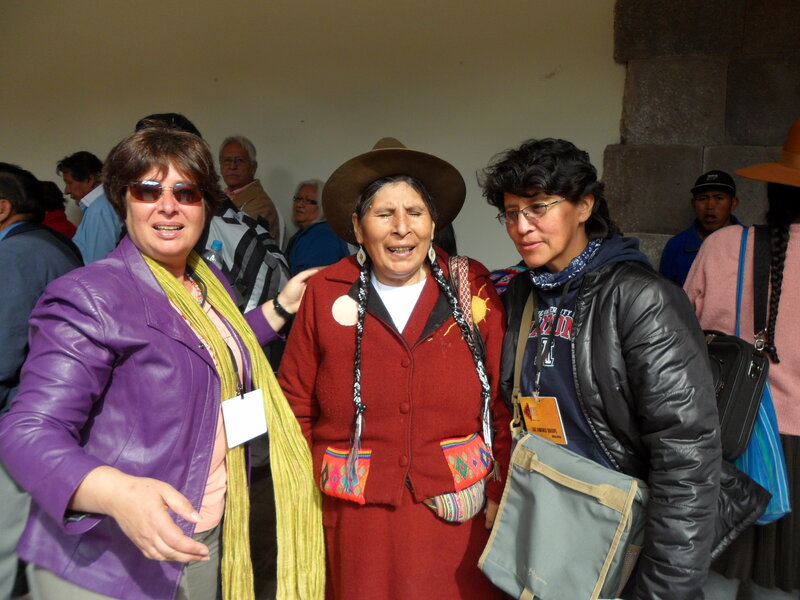 Hilaria Supa Huaman, here with another fantastic lady, Luz Jimenez Quispe, an Aymara scholar and activist. i’m sorry to report that due to an “ammendment” (sic) by the organisers, Hilaria’s presentation was moved in such a way that I’m pretty sure that no one attended it (from the afternoon to an 8:45 session on the second day of the meeting, while most of us never got the amendments, let alone read them!). Hilaria is a bit controversial in Peru, she nevertheless was a breakthrough in a system and her eyes and vivid intelligence tell more than words ever will! The very first presentation I attended was a very moving and realistic account made by a Maori mother to support a Maori school. Farrar, A. (2011). 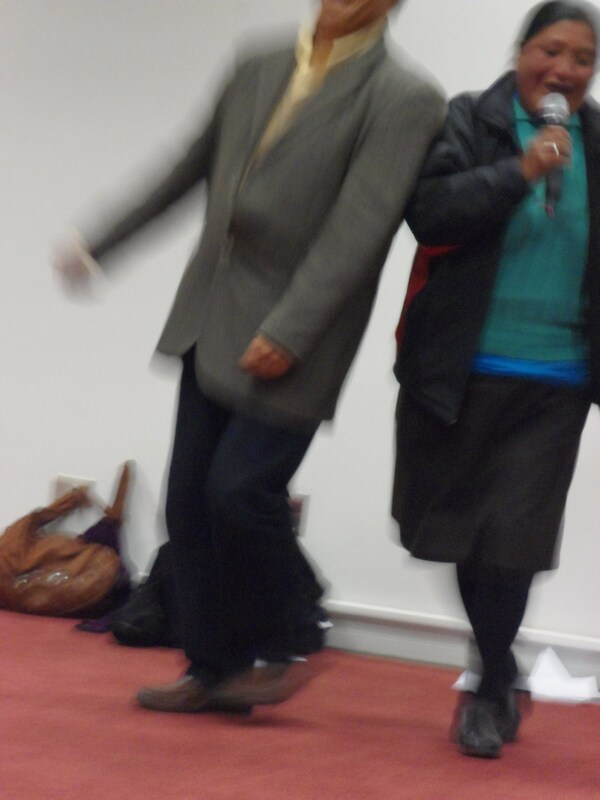 He Taonga te repo (title of her poem too). World Conference on the Education of the Indigenous People (WIPCE 2011). Cusco, Peru. Arihia started the paper by chanting her lovely poem: “we must nurture our teaching and pass our learnings down. Not watched, it gets stomped and burried underground”. Arihia isn’t an academic and her moving presentation was about her battle towards Maori language schools. Although blond and fair skinned she still is a true Maori and when, Maori unilingual at the age of school she got English translation from her Maori teacher, did she discover there was another language . When she had her daughter, she wanted to send her to a unilingual Maori school although she admits that they also speak English at home. the “Rumski” school started on the same premises of an English school and Arihia acted as the Secretary of the parents’ committee and became an activist on the cause of revitalizing her native Maori language. In 2005, they had to leave the school, with no funding and 26 kids to look after. She turned to her community and had an immediate overwhelming response in terms of donations and resources of all kinds. She had to fundraise for teachers’s wages on a weekly basis and the Parents Committee became a Management Group. In November 2006 after 6 months in an individual house, they finally made it to the “Apakura Campus” and could conduct a ‘normal school’ curriculum with a full time paid teacher and a part time assistant supported by volunteer management with a motto: “language-knowledge-experience”. In 2009 the school submitted its official application to the Ministry of Education and were told…in 2010…that it would take up to 10 months. This meant working actively more than ever again and they could add one more paid staff and more pupils. Their application was approved in Ferbruary 2011 and it gave rise to a huge celebration on July 1st 2011 for NZ independence day. The keynote on Sunday afternoon was delivered by Karihwakeron Thompson, T. on Indigenous knowledge and Education for future generations. World Conference on the Education of the Indigenous People. was probably one of the most interesting from my point of view. “I come from the Center of the Universe, like all of you and am in awe of the amazing collection of people and expertise. ” Having reminded us of how much we owe to the indigenous of this part of the world even on our food (corn, potato, cocoa) he moved to describe his Haudenosaunee (Iroquois) people between Canada and the USA, he went on describing the fact that they have indigenous laws, procedures, philosophies and structures building up a tree of peace with an eagle on top. He pointed out that this symbol with a condor or another bird is to be found in several other native cultures, the teachings and rituals of which are similar to his own within the native people. He focused on the tragedy of the residential schools, with children being removed from their home, separated from their sibblings and sent hundreds of miles away from their own homes in a deliberate attempt to “kill the Indian in the Child” as Prime minister Steve Harper described it in his moving Statement of Apology of June 11, 2008 (http://www.cbc.ca/news/canada/story/2008/06/11/pm-statement.html). For us, it’s time for a new beginning, based on the UN Declaration of Indigenous Peoples, particularly article 15 al.1 and 2. He described the Iroquois chief Deskahe’s arrival in Geneva in 1924 as a ground breaking effort. In Canada today, there is still a chronic inequity as blatantly obvious in the budget devoted to the First Nations and the fact that to become a teacher still doesn’t require any knowledge of the indigenous populations. In 2007, a “Holistic learning model” was made by Indigenous Peoples in Canada (http://www.ccl-cca.ca/ccl/Reports/RedefiningSuccessInAboriginalLearning/RedefiningSuccessModels.html) based on a lifelong journey as a learning journey based on languages, tradition and ceremonies, nation and the four dimension of personal development (spiritual, social, economic and political ). It’s a totally new approach, “redefining success in aboriginal learning”. His conclusion, pretty much in the same line as Arihia Farrar, refereed to the fact that one arrow can be broken but that many arrows together mean strength, advocating for fairness and equity. nb: links are my own, following the presentation I researched a bit around the issue (DRM). Alicia Abanto was also presenting that day, in a totally different venue, and believe me, the organisers did a great job at confusing us, letting us play a treasure hunt to find the venues and rooms, let alone redistribute the presentations at the last minute…. Ravie de rencontrer autant d’auteurs. Une chance pour trouver des idées au Pérou et dans le Monde . Comme beaucoup d’ombudsman, la Defensoria considère les questions autochtones comme prioritaires. Travaille pour que l’Etat améliore son attention à l’éducation des Peuples Autochtones. Explique son travail de recherche sur la compétence. Défendre les Droits et vérifier que les institutions publiques se conforment aux législations en vigueur. Au Pérou, les jeunes autochtones ne recoivent pas une éducation de qualité. Nous nous sommes posé la question de la gestion des institutions qui expliquent ce problème. Non seulement nous sommes les avocats mais également les superviseurs. Résultat de l’Enquête: nombre insuffisant d’éducateurs bilingues et ceux qui le sont sont insuffisamment formés à la diversité des langues amazoniennes. Au Pérou, première conclusion, pas assez d’enseignants par rapport aux élèves autochtones et ceux-ci ont une formation insuffisante ou inappropriée. 57 langues autochtones environ au Pérou au moins. Les écoles de formation des Maitres qui enseignent les langues autochtones sont nettement insufisantes (5 instituts dans tout le pays sur un total d’une trentaine). Là où il y a des peuples autochtones, il n’existe pas, dans les universités locales, une offre de formation en langue autochtones. Par ailleurs, de moins en moins de candidats se présentent pour une carrière dans l’enseignement des langues autochtones. Depuis 2007, une décision nocive du Gouvernement interdit l’entrée à l’école des élèves qui n’avait pas obtenu une note suffisante. Dans les zones amazoniennes, le total d’instituts de formation et d’universités et de candidats est très faible. Manque de volonté politique et manque de vision que la règle générale ne devrait pas s’appliquer aux peuples autochtones. On peut même parler de corruption dans ce domaine car l’argent est détourné. Les gouvernements régionaux ont une grande responsabilité dans cette situation. Il existe des programmes pour les langues andines mais pas pour les langues amazoniennes. Il est nécessaire de diversifier les orientations dans le domaine des langues afin d’équilibrer cet état de fait. Seules 15 des 55 langues amazoniennes sont étudiées. Un autre problème est que les spécialistes n’en sont pas vraiment!!!! Créer une carte linguistique et ethnique et faire un recensement officiel sur les populations autochtones. Nous offre son bouquin. Back to the conference, I attended Cajete, G., K. Nuuhiwa, et al. (2011). Ancestral knowledge of Sacred places. World Conference on the Education of the Indigenous People (WIPCE 2011). Cusco, Peru. This presentation dealt with constructions are called heau, hei means to capture and au means time. Heiau: sacred place place. pointing to the Maupiti Island where abo used to meet once a year thousands of years ago, extending it further using google map’s ruler, you end up at Easter Island. We know that they went to Peru because we have the same potato, called Kumar in Quechua and Kumara in Maori, Hawaian name is quite close too. Hawaian temples are rectangular. They travelled in 200 to the lower 8 hawaian island to do ceremony. Upright stones. checked them at solstice and equinox and found that the walls were aligned with them. They are all 0 degree North. There is a passage recognizing the change of time at the equinox in the ancestral oral tradition. Annual movement of the sun is an important element too. the temples were placed according to them. A heiau was a calendar tool for hawaiians. Upright stones also follow the sun and mark the solstices. Similar temples in the world, in Mexico. When I visited the Machu Picchu, I was able to verify that such calendar and preoccupation with the solstices and equinoxes is shared worldwide by indigenous populations. Among the other conferences dealing with indigenous knowledge, I attended the presentation by Buckskin, P. and L. O’Brien (2011). From Policy to Praxis, the time for talking is over. World Conference on the Education of the Indigenous People (WIPCE 2011). Cusco, Peru. Starts by Lewis O’Bryanrecognizing the People of Cusco. And Buckskin’s blessings from his country. ¨Prof of education and research of U of Southern Australia. How we are embedding indigenous knowledges across disciplins. Scratches more than the surface. Urgency around embedding indigenous knoledge in all sectors of education. We need to capture the space. defines praxis and policy. the time for talking is over. Adelaide based.Communities in the north of South Australia where they have intergenerational language speakers. because of isolation in desert country, they’ve been able to keep all their traditions alive and isolation from white man. Anangu people. The European named, saw and claimed. Indigenous people informs and sustains. multidimentional bodies of understandings. Ownership of the knowledge means ownership of the country. Way of looking at the world. “I am one voice, the voices of my ancestors come from a circule of peoples, the first circle of humanity to form. Their voices were one when spoken in unison. The circle of people embraced the voices. They sang the song, repeating the process over and over. That was the law. Need for more indigenous scholar in the academy. Only the further growth of our scholar can garantee challenging the mainstream way of thinking. Two areas of engagement: continued support of abo knowledge. Growing trend to include indigenous knowledges. Senior academic position filled by abos. Elders appointed, such as Uncle Lewis O’Brien, a Kaurna Elder and an adjunct research fellow within the David Unaipon College of Indigenous Education and Research, has recently won one of the most prestigious research grants to research Indigenous knowledges to fight wild fires. importance of developing polices garanteeing that they do more than paying lip services to the abo perspectives. Active involvement of indigenous people is key to this success. We still don’t have the critical mass of abo academics although it’s work in progress. Finally, I attended on Tuesday Sayet, R. (2011). Devils and Giants in Southern New England: the Appropriation of Native Sites by the English Colonists. World Conference on the Education of the Indigenous People (WIPCE). Rachel comes from a Mohegan Tribe. Her mother and aunt are those who passed the stories about the little people and the giants. Specific stories about central places. Red cliffs come from the blood of the whales used for sacrifices. English colonizers transformed everything sacred to the indigenous into demonized places. That’s Rachel’s thesis. 3 sites demonized and diminished status for native beliefs. Spirituality of tribe. Mondu is who we pray to. 17th century of reformed people to the new world: more service to the lord. idea that they were superior to the natives. Animate and inanimate world exist in a reciprocal relationship. Christianity and Colonialism have reshaped the stories including now the devil after colonization. 1) Marhsap/ Devil’s Bridge: long underwater obstruction. City of Columbus ship sunk there. one of the worst marine disaster in New England. Uprooting of trees, Smoking pipe. inappropriation: Marshap is not a god, he was in fact disgusted and turned himself into whale. her great aunt, Medicine woman Gladys Tantaqui’dgeon.was quite instrumental in conveying the real story. Saddle Back Rock: show that native culture isn’^t static and changes. 2) Devil’s Footprint: Miss Huntington built a church on traditional Mohegan site. Near it is a large rock and call by indigenous Marcha’s footprint. 3) Devil’s Hopyard. in a town with a long story of earthquakes. Our religion is not fragmented. The last fluent speaker died in 1908 and we can now take classes. There is no separation between ourselves, our lands and our beliefs. Among the very impressive presentations, let me introduce the very knowledgeable and dedicated scholar I was honoured to meet, Luz Jimenez Quispe whose presentation dealt with Educacion y descolonizacion en Bolivia, El desarollo de capacidades en interculturalidad en las politicas publicas nacionales y locales. World Conference on the Education of the Indigenous People. Welcomes us in Aymara. Aymara is present in 4 countries Bolivia, Peru and northern Argentina and Chile. “Our president is Aymara. We are in the middle of a great change in education and culture in our country. We are recuperating our own history and spirit. I will be dealing with Bolivia today, the cultural revolution taking place right now, Challenges in the future. 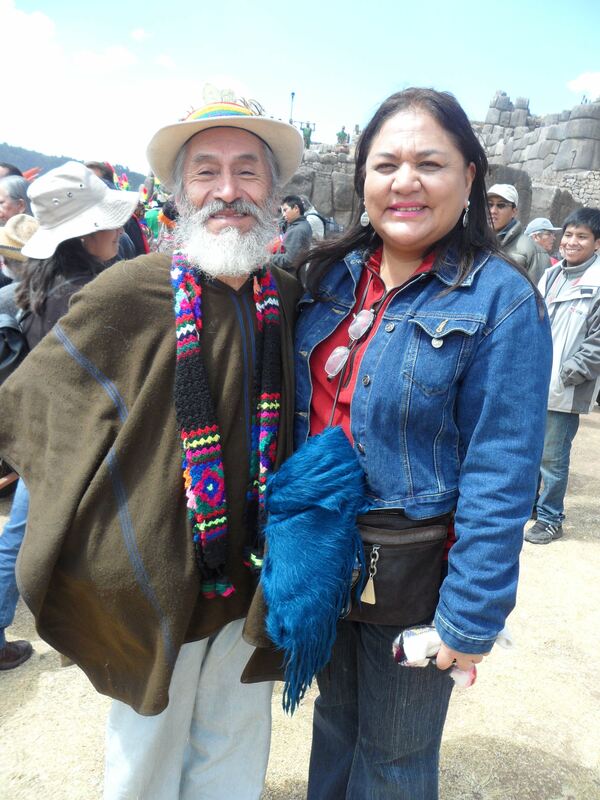 I speak as an urban aymara activist and academic educator. My country is the belly button of the world. We are, as indigenous movement, trying a new world vision. We need to create a humanity thinking through many bodies and one mind. Decolonisation means a historical fact as well as a contemporary situation. Bolivia has 10 million inhab. adm. capital Sucre. Population in urban areas has drastically increased from 26% in 1950 to 63% today. How are we going to build this country. Indigenous populations now are fragmented. since 1900s, the indigenous have fought for education (they had to have secret schools where it was forbidden to learn the alphabet because an educated indian is a lost indian), to defend our land, our mother, preserve our autonomy. We are trying to change things but the colonial model is still prevalent in the Americans. We want independance in the Americans. These clandestine schools were connected to the indigenous movements and their leaders were teaching there. That’s when was created the Ayllu schools. In it was discussed life from the wisdom and knowledge of our population. 10 years later, it was closed down by government. In 1952 was when Indigenous were granted schooling right, citizenship, agrarian reform, the right to vote and nationalisation of the resources. In 1931 in my country, there were two types of IDs, the citizens and the Indians. From 1955 to 1994 the assimilation was the form of education. Only in spanish, using indigenous languages only as a tool to make kids understand. She presented the two education models, urban and rural (=indian). “We were citizens of second class, we were ashamed of of our history, language and culture, forbidden to use our native languages in any space in schools. We grew up looking towards Europe instead of where we were. No traditions, no languages…”.The Education reform of 1994 meant Bilingual Intercultural Education for all, new curriculas, training of teachers, change of infrastructure, researcher, quality control and one big mistage, the constituion of Indigenous Education Committee CEPO. That’s when we started wonderning why we were only educated to become second class citizen. So from 2004 we started making indigenous claims on autodeterminations, territorial organisation, EIB fora ll, relation between eco development and educative development, training of teachers in EIB, Indigenous University, learning to produce respecting the land instead of producing the land to the point of destroying it. So this model had to encompass these development. Not only the law but the constitution was changed to include all the indigenous languages as official. Every service has to be bilingual. They have two years to learn one indigenous language if they want to keep their job. First and for all we look at our own group. We look at the answers in our own roots, history and experience. We dream of a new Latin america where indigenous people will dance and pray together, but also produce together. For the moment, Latin america produces for the whole wolrd and we get nothing but debt in return. We are now working on a new organisation model (government of bolivia webpage ) We think bottom to top, starting with family, community, country and world. The fight is now epistemologic. 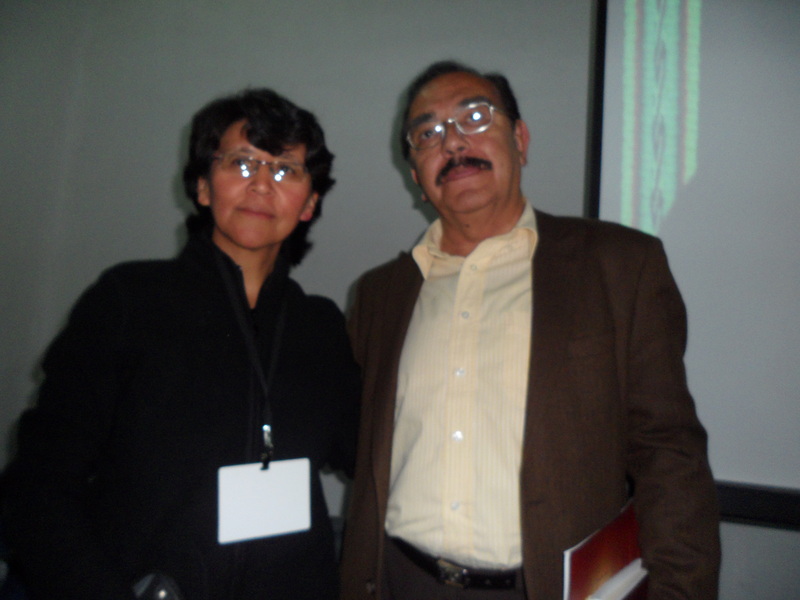 As for Miryam Yataco and Gustavo Solis, I only attended partially their presentation as Miryam was right after mine and Gustavo’s was extremely difficult to understand due to the lack of preparation from the translators (not easy to discover the topic while the speaker is on stage…). Here is what I managed to note, but I am expecting their slides any minute. Miryam started with a brilliant demonstration that Tupac Amaru was unwillingly instrumental in the eradication of indian languages at the profit of spanish. After Tupac Amaru, Spanish only. Language policy, very tied to educational policy. Castellanization, implied language loss, imposition of the written culture, cognitive violence against the language and speakers but against the way they use knowledge. Schooling meant and means relinquishing mothertongue and native literacies. Quechu language, considered the main language in terms of numbers, overshadowing all other native languages. 8 to 14 million speakers. Spread throughout 6 S. American languages. Yet large variety. Cf. Seran Palomino. What does it mean to be in 2011 to be anative speaker of an indigenous language in Peru when you live in a society in which the school is characterized by a long tradition of hegemonic Spanish-onliy monolingual school system. What does it mean to attend a school in which indigenous bilingualism and consequently indigenous children are discriminated against? We have challenged the prevailing ideology. Spanish-only policy in Latin America meant exclusion, homogenizing, imposing one language over the diversity of languages in the territories. It’s a linguistic apartheid. Humala could bring the Republic of Indians. Exerpt from Bill 809 (2010) article 3 the rights of all people. Showed the Congress woman Maria Sumire who refused to take oath in Spanish, not even to be translated in Spanish, Shuar Velazquez and Quechua artists. This was a very lively presentation with several media which managed to depict with great clarity the essence of the present day struggle to preserve and support the native languages in Peru. I will repost Miryam’s ppt as soon as I get it. I was too fascinated by the rhythm of his feet to take his face...sorry....great dance! Here are my notes, a bit of all languages, but should you protest, on this one or the others, I’ll straighten it up. Otherwise, I fear it might take a while…. Map of Peru with 4 languages of Peru. We want to bring two statements: all people have knowledge to live and survive! Knowledge is different from scientific knowledge different kinds of knowledge, we know through revelation, guessing, dreaming, hallucinations, visions Logic is not universal. Some people have various specfic knowledge and it’s reflected in their names. We have to address: epistemic decolonization to acknowlege and understand other kinds of knowledge We should develop knowledge and seek for the possibility to develop science and research on intercultural basis, not only during an activity but also in epistemological terms. For example, he notes the absence of metaphores in quechua I It is not easy to establish a scientific dialogue between those who experience science within multicultural contexts. Presently we should rather refer to an intercultural monologue. It is necessary to trenscend it. We should cease “la caza de brujas, de chamanes” and build a science which is a system of life on the planet based on a new relation with nature. We should create a new concept beyond its condition as an object to be approved. We should integrate the cosmovision such as the “duenio de la cosas” specific to the amerindian peoples. The duenio category (of forest and fish) refers to indigenous beings which are invisible. We should focus on a further intercultural dialogue as well as between species as an assertion of life as the ultimate goal for integrity. He mentions the multiple strategies of knowledge such as the Aymara culture which has lead experiments to the highest degree. Cultural differences, different possiblities in different people. knowledge as a process those who help to investigate problem of knowlege process of knowing attitude about knowing the validity and reliablitity of knowledge. Knowledge organises information. knowledge as a science of life and for life relation between people with nature. Observation, as a cognitive operation of the highest importance. Western science considers that everything can be an object of research, yet interculturality doesn’t. The most important is the immense trust by the members who contributed to the research for a new kind of knowledge. Wow, It’s really neat to see that from the whole audience I had, that you actually listened to my presentation and captured the essence of it. very humbling to read your notes. Thank you.